"...upon the altar of God..."
Steven (Chicagoland, United States) on 4 June 2010 in Architecture and Portfolio. 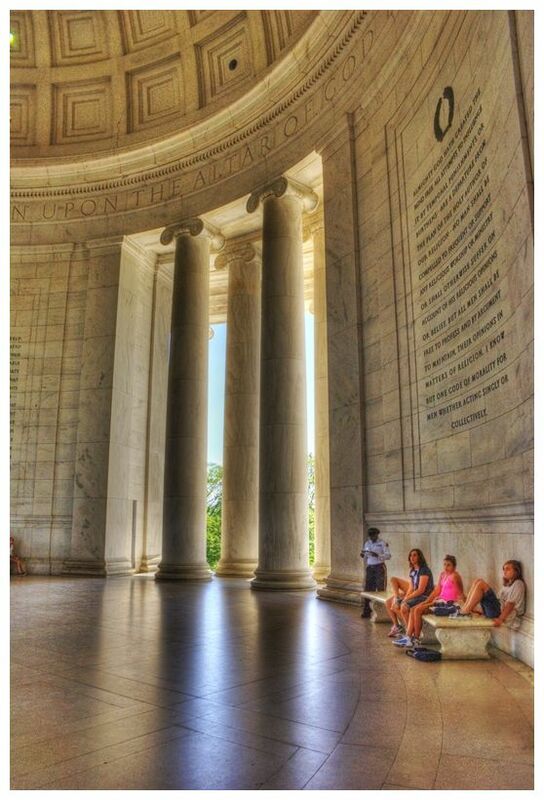 The interior of the memorial has a 19-foot tall, 10,000 lb bronze statue of Jefferson by sculptor Rudulph Evans, which was added four years after the dedication. The interior walls are engraved with passages from Jefferson's writings. Most prominent are the words which are inscribed in a frieze below the dome: "I have sworn upon the altar of God eternal hostility against every form of tyranny over the mind of man." This sentence is taken from a September 23, 1800, letter by Jefferson to Dr. Benjamin Rush wherein he defends the constitutional refusal to recognize a state religion. We hold these truths to be self-evident that all men are created equal, that they are endowed by their Creator with certain inalienable rights, among these are life, liberty, and the pursuit of happiness, that to secure these rights governments are instituted among men. We...solemnly publish and declare, that these colonies are and of right ought to be free and independent states...And for the support of this declaration, with a firm reliance on the protection of divine providence, we mutually pledge our lives, our fortunes, and our sacred honour. The excerpts chosen from the Declaration have been criticized because the first half alters Jefferson's prose (for the sake of saving space) and eliminates the right of revolution passage that Jefferson believed was the point of the Declaration, while much of the second half (from "solemnly publish" to "divine providence") was not written by Jefferson. Note also that it writes "inalienable", as in Jefferson's draft, rather than "unalienable", as in the published Declaration. That's so huge ! Very impressive how tiny we look. I love how lights enter the building. An effective tone-mapping. You have caught the sense of vast space so well in this . . the tiny figures make good emphasis of that, too. Super . Super compo , but light , and this light on the floor looks delicious ! Superb composition. Images on the soil are splendid. Have a lovely afternoon Steven. Wonderfully proportioned frame to emphasise the height. Magnificent. The Jefferson Memorial is one of my absolute favorite D.C. places. Thanks also for sharing some of the inscriptions it contains. A very beautiful image. Jefferson's words describing freedoms are ones we should remember it seems. Almost clear enough to read and the reflections on the floor are so smooth, silken.. you are a master at processing. incredible history and quotes - thanks! An amazing place! History of america is very interesting for me. Love USA ! Beautiful shot! I like your careful hdr treatment here! HDR on this interior is very special. Having the people really gives a sense of scale. An excellent photograph, beautiful framing, Yours sincerely. Hi Steven - Not only is your photograph beautifully framed here, but your diligence in providing full and proper background information makes for a complete piece of art in it's own right. This is fantastic sir. Jeffersonian philosophy, what I know of it, is what a real America should be about. Great eye for composition on this, Steven. You given the grand scale of this monument and balance to the image with the people. I like the amount of HDR you used here, and the soft reflection of the columns. This image actually makes me want to go there.